Consistent durable case taper that manually adjusts to handle multiple box sizes. Rugged construction with 16-gauge welded steel frame and powder coat paint finish. Side belt drive for narrow profile boxes. Food and beverage, paper and print, distribution centers, pharmaceutical and general industrial. Case sealing, box sealer, taper, adjustable case sealer. 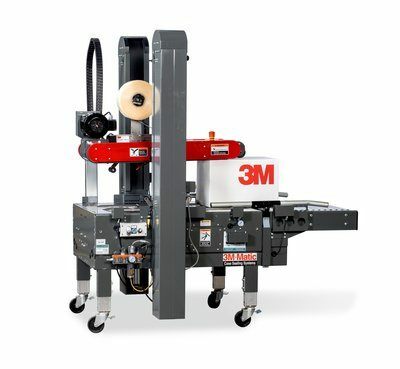 3M-Matic™ Random Case Sealer 7000r3 High Speed Pro With 3" 3M™ AccuGlide™ 4 Taping Head is an advanced technology case sealer and ideal solution for top and bottom sealing of random-sized cases. Automatically adjusting to both case height and width, our 3M-Matic™ Random Case Sealer 7000r3 High Speed Pro can handle up to 28 different case sizes per minute. Seals case lengths of 6 inches and up, widths of 7 inch - 26 inch, heights of 3.25 inch - 36 inch.